Festive moments, fun encounters, Nordic maritime atmosphere. These three main lines describe the framework for the design of the new and impressive passenger ship. The themes were highlighted in an extensive passenger survey, which analysed the ship’s most important customer groups – and all of their expectations, wishes and needs. The purpose of the customer survey, commissioned by Midway Alignment, was also to enable the ship’s future users, i.e. the passengers, to influence the new ship’s design and services. As a result of the extensive customer survey, it has been possible to prioritise the most important passenger groups: transit, cruise and conference travellers. Although all of the groups have different reasons for stepping on to the ship, the goal is to fulfil everyone’s expectations. “Transit passengers cross the Kvarken because it is the most convenient route. They are hoping for and expecting an as easy and hassle-free voyage as possible, with first-class service. Cruise passengers are leisure-time travellers who want experiences and pleasant surprises in addition to a smooth, untroubled journey. Conference passengers, on the other hand, are seeking above all excellent working facilities and IT services,” explains Vaasa Regional Development Company’s (VASEK) logistics expert, Riitta Björkenheim. The intention is to fulfil passengers’ wishes through the careful and even ingenious design of the ship. For example, the same kitchen can, with the right space division, offer a number of different restaurant moods, and the post-glacial land uplift of the Kvarken region can be viewed on the deck of the ship through the enhanced reality offered by smart phones and tablet devices. The Kvarken Lab concept, on the other hand, could present and visualise the technology used on the ship and also serve conference passengers. “It is important for passengers to be positively surprised. The interior decoration, lounge and working facilities must be well designed. Foreign visitors may also be impressed by the dark, quiet sea, when it can be enjoyed on a nice terrace,” says Björkenheim. Information about the unique nature of the region as well as the services of Vaasa and Umeå must be readily available on board. Björkenheim also considers the ship to be a floating bridge that will present what both cities have to offer. When the atmosphere of the voyage is fun and inspiring, passengers will want to repeat the experience. The new Wasaline Kvarken Lab service will visualise the ship’s technology and also serve conference passengers. 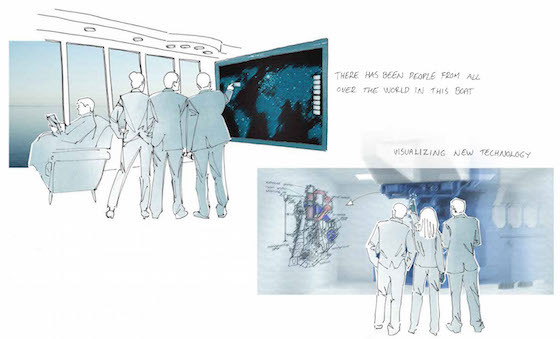 Passengers will be able, for example, to mark their own home town on a large touch-screen map of the world, and the study the new technology of the ship’s engine on a giant display. The passenger analysis commissioned by Wasaline, VASEK and various other partners is currently a valuable source of information, when the new ship is on the drawing board. Björkenheim knows that good design of facilities and services can make the entire ship concept unique. Björkenheim is very happy about the partners’ fruitful and inspiring cooperation with Western Finland Design Centre MUOVA, which carried out the analysis. The results provide an excellent basis for continuing Wasaline’s success story.